"Chukcha" redirects here. For the breed of dog, see Siberian Husky. 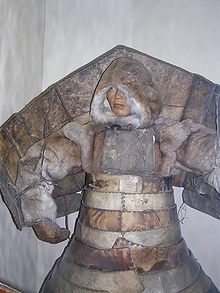 The Chukchi, or Chukchee ( Russian: Чукчи, sg. Чукча), are an indigenous people inhabiting the Chukchi Peninsula and the shores of the Chukchi Sea and the Bering Sea region of the Arctic Ocean  within the Russian Federation. They speak the Chukchi language. The Chukchi originated from the people living around the Okhotsk Sea. According to most recent genomic research ("Who we are and how we got here. Ancient DNA and the New Science of the human past", by David Reich. Pantheon books, New York, 2018), Chukchi people are the closest cousins of the First Americans in Asia. The majority of Chukchi reside within Chukotka Autonomous Okrug, but some also reside in the neighbouring Sakha Republic to the west, Magadan Oblast to the southwest, and Koryak Autonomous Okrug to the south. Some Chukchi also reside in other parts of Russia, as well as in Europe and North America. The total number of Chukchi in the world slightly exceeds 16,000. The Chukchi are traditionally divided into the Maritime Chukchi, who had settled homes on the coast and lived primarily from sea mammal hunting, and the Reindeer Chukchi, who lived as nomads in the inland tundra region, migrating seasonally with their herds of reindeer. The Russian name "Chukchi" is derived from the Chukchi word Chauchu ("rich in reindeer"), which was used by the 'Reindeer Chukchi' to distinguish themselves from the 'Maritime Chukchi,' called Anqallyt ("the sea people"). Their name for a member of the Chukchi ethnic group as a whole is Luoravetlan (literally 'true person'). After the collapse of the Soviet Union, the state-run farms were reorganized and nominally privatized. This process was ultimately destructive to the village-based economy in Chukotka. The region has still not fully recovered. Many rural Chukchi, as well as Russians in Chukotka's villages, have survived in recent years only with the help of direct humanitarian aid. Some Chukchi have attained university degrees, becoming poets, writers, politicians, teachers and doctors. Russians first began contacting the Chukchi when they reached the Kolyma River (1643) and the Anadyr River (1649). The route from Nizhnekolymsk to the fort at Anadyrsk along the southwest of the main Chukchi area became a major trade route. The overland journey from Yakutsk to Anadyrsk took about six months. The Chukchi were generally ignored for the next 50 years because they were warlike and had few furs. Fighting flared up around 1700 when the Russians began operating in the Kamchatka Peninsula and needed to protect their communications from the Chukchi and Koryak. The first attempt to conquer them was made in 1701. Other expeditions were sent out in 1708, 1709 and 1711 with considerable bloodshed but little success. War was renewed in 1729, when the Chukchi defeated an expedition from Okhotsk and killed its commander. Command passed to Major Dmitry Pavlutsky, who adopted very destructive tactics, burning, killing, driving off reindeer, and capturing women and children. In 1742, the government at Saint Petersburg ordered another war in which the Chukchi and Koryak were to be "totally extirpated". The war (1744–7) was conducted with similar brutality and ended when Pavlutsky was killed in March 1747. It is said that the Chukchi kept his head as a trophy for a number of years. The Russians waged war again in the 1750s. In 1762, Saint Petersburg adopted a different policy. Maintaining the fort at Anadyrsk had cost some 1,380,000 rubles, but the area had returned only 29,150 rubles in taxes, the government abandoned Anadyrsk in 1764. The Chukchi, no longer provoked, began to trade peacefully with the Russians. From 1788, they participated in an annual trade fair on the lower Kolyma. Another was established in 1775 on the Angarka, a tributary of the Bolshoy Anyuy River. This trade declined in the late 19th century when American whalers and others began landing goods on the coast. The first Orthodox missionaries entered Chukchi territory some time after 1815. Apart from four Orthodox schools, there were no schools in the Chukchi land until the late 1920s. In 1926, there were 72 literate Chukchis. The Soviets introduced a Latin alphabet in 1932, replacing it with Cyrillic in 1937. In 1934, 71% of the Chukchis were nomadic. In 1941, 90% of the reindeer were still privately owned. So-called kulaks roamed with their private herds up into the 1950s. After 1990 and the fall of the Soviet Union, there was a major exodus of Russians from the area. ^ Chisholm, Hugh, ed. (1911). "Chukchi" . Encyclopædia Britannica. 6 (11th ed.). Cambridge University Press. p. 323. ^ "Amazing Life Of Chukchi". English Russia. Archived from the original on 7 May 2011. Retrieved 7 May 2011. ^ a b Shentalinskaia, Tatiana (Spring 2002). "Major Pavlutskii: From History to Folklore" (PDF). Slavic and East European Folklore Association Journal. 7 (1): 3–21. Archived from the original (PDF) on 17 July 2011. Retrieved 18 July 2009. Forsyth, James, 'A History of the Peoples of Siberia', 1992. Anyiszimov, A. F. (1981). Az ősközösségi társadalom szellemi élete (in Hungarian). Budapest: Kossuth Könyvkiadó. ISBN 963-09-1843-9. Title means: "The spiritual life of primitive society". The book is composed out of the translations of the following two originals: Анисимов, Ф. А. (1966). Духовная жизнь первобытново общества (in Russian). Москва • Ленинград: Наука. The other one: Анисимов, Ф. А. (1971). Исторические особенности первобытново мышления (in Russian). Москва • Ленинград: Наука. Patty A. Gray (2005). The Predicament of Chukotka's Indigenous Movement: Post-Soviet Activism in the Russian Far North. Cambridge. ISBN 0-521-82346-3. Anna Kerttula (2000). Antler on the Sea. Cornell University Press. ISBN 0-8014-3681-8. "The Chukchis". The Red Book of the Peoples of the Russian Empire. "All Things Arctic". Archived from the original on 15 May 2013. Zolotarjov, A.M. (1980). "Társadalomszervezet és dualisztikus teremtésmítoszok Szibériában". In Hoppál, Mihály (ed.). A Tejút fiai. Tanulmányok a finnugor népek hitvilágáról (in Hungarian). Budapest: Európa Könyvkiadó. pp. 29–58. ISBN 963-07-2187-2. Chapter means: "Social structure and dualistic creation myths in Siberia"; title means: "The sons of Milky Way. Studies on the belief systems of Finno-Ugric peoples". Ĉukĉ, Even, Jukaghir. Kolyma: Chants de nature et d'animaux. Sibérie 3. Musique du monde. Wikimedia Commons has media related to Chukchi people. Bogoraz, Waldemar (1904). The Chukchee. Vol. 11 Part 1: Material culture (pdf). Memoirs of the American Museum of Natural History. Leiden • New York: E. J. Brill ltd • G. E. Stechert & Co.
Bogoraz, Waldemar (1907). The Chukchee. Vol. 11 Part 2: Religion (pdf). Memoirs of the American Museum of Natural History. Leiden • New York: E. J. Brill ltd • G. E. Stechert & Co.
Bogoraz, Waldemar (1909). The Chukchee. Vol. 11 Part 3: Social organization (pdf). Memoirs of the American Museum of Natural History. Leiden • New York: E. J. Brill ltd • G. E. Stechert & Co.
Bogoraz, Waldemar (1910). Chukchee Mythology (pdf). Memoirs of the American Museum of Natural History. Leiden • New York: E. J. Brill ltd • G. E. Stechert & Co.
Siimets, Ülo (2006). "The Sun, the Moon and Firmament in Chukchi Mythology and on the Relations of Celestial Bodies and Sacrifices" (pdf). Electronic Journal of Folklore. Estonian Folklore. 32: 129–156. doi: 10.7592/fejf2006.32.siimets.